Color does not exist, but is created in our brains. In order to see color we need light, an object and our eyes. Color arises in the presence of light. Whenever light falls on an object, some of the rays are reflected by the object and the remainder is absorbed. The part that is reflected, determines the color. Our eyes cannot perceive the light that is absorbed by an object. An apple, for example, absorbs all colors, except green. 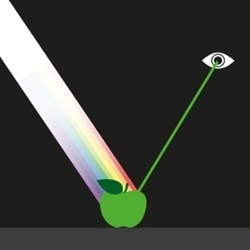 Because the green is reflected and is captured by our eyes, we see the green color of the apple. If all the light rays are absorbed, we get black, and when all the light rays are reflected, we see white. Thus, a black object absorbs all colors and is therefore sometimes described as colorless. For the same reason, black objects also soak up more heat than white ones, because white reflects all colors or wavelengths. The most ideal light for seeing color is diffuse daylight, when the sun is more or less behind the clouds and it is slightly rainy. This produces the most truthful colors. In artificial light, it is more difficult to perceive color in a precise way. The main reason is that artificial light, such as that of a fluorescent lamp, is often tinted blue or red. A color can therefore look different under various light sources. Even natural light such as candlelight emits an abundance of yellow and red, because the light source does not contain enough blue. Metamerism is the phenomenon in which colors appear to be the same in a certain light, but turn out to be different with other lighting circumstances. That is why it's important to compare colors in ideal and comparable lighting circumstances. The presence of an object is the second condition for perceiving color. The object itself may either emit light, reflect light or a combination of both. Also the surface of the object is important for seeing color; a shiny object reflects light differently than an object that is matte. The third condition for seeing color, is that the rays should be caught by the eye. The light rays enter the pupil, through the lens and the eyeball and land on the retina. The receptors in our eye, consisting of rods and cones, ensure color perception in our brains. The extent to which the cones vibrate is translated by our brains into different colors and shades. The rods, in turn, are sensitive to the intensity of the light. Consequently, they cannot tell the difference between colors or hues that have the same intensity of light. We have about six million cones: an average of two million red, three million green and one million blue. The color that we see is formed by these three impulses. 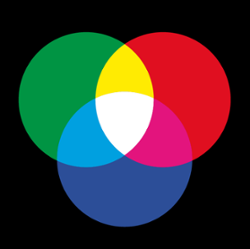 Red, green and blue (RGB) are therefore called the optical primary colors. People with color blindness have deficient color receptors. 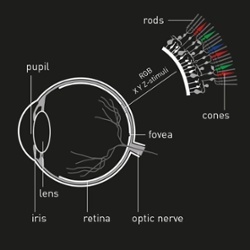 Aside from cones, our eye possesses some 120 million rods, which are unevenly distributed across our retina. The rods contain a visual pigment that changes structure, depending on the light intensity, and so transmits a signal to the brain. The human eye has a particularly large adaptability, which is why we're able to compensate for extreme differences in brightness. Thus if, for example, we drive through a long tunnel and our eyes have adjusted to the darkness, we can see normally again in bright sunlight relatively quickly. Research into color began around 1700 when Newton deflected a light beam with his prism, making the different colors of the spectrum visible. The British physicist demonstrated hereby that white light is composed of all the colors of the spectrum. This discovery laid the foundation for the understanding of color as a physical phenomenon. His research is the point of departure for various models and theories that have since been developed to understand and measure color. In the investigation of color, the question whether light should be considered as a wave phenomenon or whether it could better be explained as a particle stream has always been a central one. At the beginning of the last century, physicists Max Planck and Albert Einstein provided a breakthrough. Just like sound, their research confirmed, light travels as a wave. This made it possible for the first time, to accurately measure and get to the bottom of the phenomenon of color and light. Specifically, a wave has a certain length (which is expressed in nanometers, nm), which is dependent on the frequency (which is expressed in hertz, Hz) of its vibration (which is expressed in milliwatts, mW). The frequency of the vibrations determines how strongly a particular color is reflected to our eyes. We call this aspect the color strength or chroma. For example, yellow-green has a maximum vibration at a wavelength of 550 nm. It is important to know that the range of human perception lies between 380 nm (UV, ultraviolet) and 780 nm (IR, infrared). This has to do with the maximum vibration frequency that our eyes can perceive. Colors strong in grays provide a hazy image to the brain. The scientifically proven Color Navigator System solely clusters the useful color range. In other words: all colors that are beyond the reach of our perception are omitted and the colors that do give sufficient impulse to our brains are clustered. In a wavelength curve, the relationship between the vibration and the length of a wave is displayed. Every color has its own, unique wavelength curve. A horizontal curve representing our visible spectrum, is black at 0 mW, white at 100 mW and gray at mid-height. The colors of the spectrum can also be arranged in a color wheel. In principle, this gives the same representation as the horizontal axis of the wavelength curve, but then in a curved line around an axis. 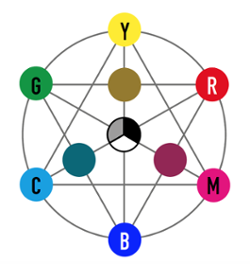 The color wheel is used in a counterclockwise direction: the colors range from red at 30º, yellow at 90°, green at 150°, cyan-blue at 210°, blue at 270° and magenta-purple at 330°. When working with color, we distinguish two methods: additive and subtractive. On a monitor, display or television screen, colors consist of red, green and blue (RGB). But when it comes to printed media, prints or paint for objects or dyes, cyan, magenta and yellow (CMY) form the basis to compose colors. We call working with RGB the additive use and working with CMY the subtractive use of color. In the additive system, red, green and blue are the primary colors. They are displayed by using a light source and monitor, and consist of red, green and blue percentages, with which millions of colors can be formed. 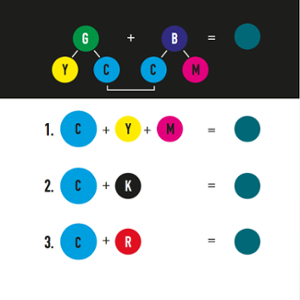 By mixing two additive primary colors in equal proportions, secondary colors arise; in the additive system, these are cyan (green + blue), magenta (red + blue) and yellow (red + green). An equal amount of the three colors results in white. Because the RGB system is connected with a display on a monitor, color differences will be perceptible among the different types of screens. A monitor is therefore best calibrated or adjusted to an appropriate color profile. We call mixing colors with paint or ink subtractive color mixing. Cyan, magenta, and yellow are in this case our primary colors. 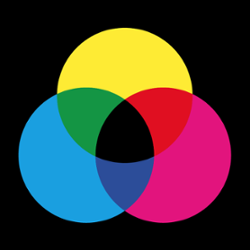 If we mix two of these in equal proportions, we get red (magenta + yellow), green (yellow + cyan), and blue (magenta + cyan), this time called the secondary colors. We can make colors lighter by adding white or make them grayer by adding black. In this way, different shades of the same color arise. In theory, using cyan, magenta and yellow, every other color can be made, but in practice it is impossible to mix neutral gray or pure black. We use primary and secondary colors for mixing. When we mix colors subtractively, for example with paint or ink, there are several options to achieve almost the same result. "Almost", because our brains experience the different ways to mix the same color differently. Primary colors are colors in their pure essence: yellow, cyan and magenta. These colors cannot be created by mixing other colors. Secondary colors are mixed forms of two primary colors in a certain proportion, such as green, orange and purple. Primary and secondary colors are pure colors. They are located at the edge of the color wheel and have a maximum saturation of their chroma. Three primary colors or a combination of a primary and a secondary color in which the primary color is not present. A primary color with black. A primary color and its complement. The best result – which our brain perceives as most beautiful – is created when mixing complementary colors (see later), such as in option 3. By applying this way of mixing, the primary color, to which the color to be mixed is closely related, constitutes the starting point. By then adding the complementary color, the main color will stand out more and get more character. The created color will give our brain a more pure color impulse. Option 2 is the least expensive way of mixing. Option 1 produces the least beautiful result, because, by using three primary colors, this causes our brain to see more grayscale. Trichromatic black is the black that occurs when mixing the three primary colors. The result is very dark anthracite (almost black). To make a color grayer or to mix color, it is better to use trichromatic black or anthracite and never use true black (ink black). This way the color stays pure. Over the course of time, all kinds of systems and theories have been developed to arrange and map colors in a universal, easy to use way. Well known examples of color systems are Munsell’s color atlas and its derivative color systems such as HSV and HCL. 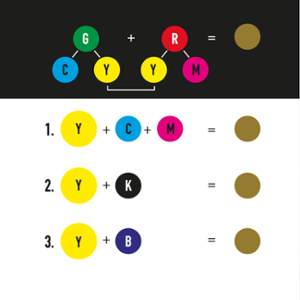 The Munsell Color System was developed at the beginning of last century by Munsell, the American inventor and artist. In this system, 1500 colors were visualized in a sphere around an axis of grayscale values. Horizontally, there was a gradient from neutral gray to full saturation. Munsell called these values: hue, chroma and value. Hue stands for color tone and represents the location of a color on the color wheel. One speaks of the hue- or color angle, which is expressed in degrees. The strength of a color is called chroma by Munsell. Maximally saturated colors are the most intense colors. Value indicates the brightness: the amount of light that is reflected by a color. White, for example, has the greatest brightness and black the least. 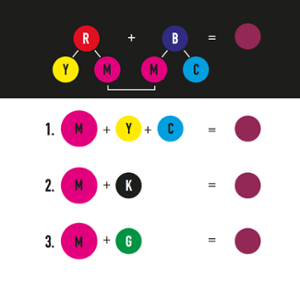 It was significant that Munsell discovered that the full chroma of individual colors could be achieved at different locations in the color area. Yellow reaches its optimal color, for example, at a much higher saturation than red. This has led to a visual representation of an asymmetrical sphere or spinning top. 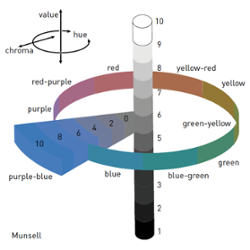 The Munsell Color System was created empirically and is mainly based on how we perceive color. It has a less mathematical and scientific basis, but provided important insights into saturation and is still a recognized color system. The company that Munsell founded in 1918 still exists. CIELab is a color system that was launched in 1976 by the Comité International de l’Eclairage (CIE). The commission was established as an independent forum that, among other things, had as its objective the development of an international standard. The CIE model approximates the human perception of color as closely as possible and constitutes the basis and standard on which our Color Cluster System was developed. 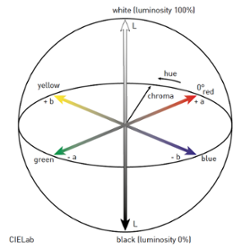 CIE developed a first step towards a standard color observer in 1931 and presented a revised version in 1976, in which the most important adaptation was to turn the color wheel, so that red came to be at 0° and yellow at 90°. This was because the colors enter our brains in a specific sequence (first red, then green and then blue). Red produces the most powerful impulses and is therefore the strongest color, followed by green and blue. A color observation will translate a color between the receptors and the brain with distinctions between light and dark, indicated by a vertical L or luminosity axis, which represents the brightness, and between red, green, blue and yellow, indicated by the horizontal a and b axes, which represent the observable color space. As we just saw, color is indicated by three values: the L-value indicates the brightness on a scale from 0 (black) to 100 (white), the a and b values define the color. We can measure these three values with a colorimeter or spectrophotometer that is converted to Lab values. By combining the coordinates of the three axes, we arrive at a clear position of a color in the color sphere, which in reality is not a perfect sphere, given the differences in saturation, as discovered by Munsell. HSV and HCL are two very simple models for defining color for desktop applications and graphic programs, closely corresponding to the way we perceive color. To some extent, it is comparable to Munsell’s system because it takes hue, chroma and value as its starting point on three similar axes in order to define a color. In HSV, these are hue, saturation and value. In HCL, they are determined by hue, chroma and luminosity. Moreover, HSV also exists under the name of HSB, hue, saturation, brightness, and HCL also commonly appears as LCH, luminosity, chroma and hue. The values of HSV and HCL are comparable. HSV is often used in graphics software. By specifying a hue and saturation rate, it is possible to set the brightness using the scrollbar and thus to select millions of colors. The digital era demanded a universal color coding, which, inter alia, could easily be used in HTML. Thus, the HEX value was created as the standardized translation of the RGB. It is a value from 0 to 255, noted in a hexadecimal system consisting of 16 symbols: the digits 0 through 9 and the letters A (= 10), B (= 11), C (= 12), D (= 13), E (= 14) and F (= 15). Interested to find out what our color experts can do for you? Feel free to contact us.